Canadian training jump from Dakota C-47. The original hand-written copy of this is on 1 CANADIAN PARACHUTE BATTALION letterhead with 1 Canadian parachute badge (‘wings”) printed in colour above the unit name. It was obtained from Sgt. Russell Wyrostok, Platoon Sergeant, Anti-Tank Platoon, Headquarters Company, 1 Canadian Parachute Battalion in W.W. II. Is everybody happy? cried the sergeant looking up. He felt the wind, he saw the clouds, he felt the awful drop. COMMENTS: The chorus was not on the original letter, but is well known. Some people now like to substitute the word ‘Gory’ for ‘Glory’. The words of the verses have changed over the years, but this is a W.W. II version. 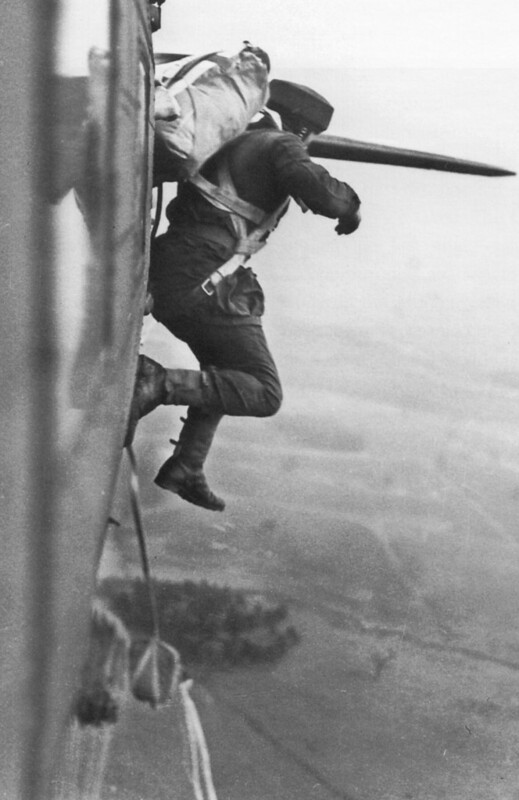 The reference to “pulling the cord” refers to the reserve parachute release on the American T-5 parachute that they trained with at Fort Benning, Georgia and at Camp Shilo, Manitoba. In England and in battle they used the British ‘X’ type parachute which did not have a reserve chute. 1 Commando Company [Now 4 Royal Australian Regiment (Commando)] They had their own version of the Paratrooper’s song, Here is a verse sent by KEVIN HULTON-SMITH who served with them from 1963 till 1978. That he ain’t gonna jump no more.